Acai berry is an excellent source of antioxidants which help to boost our immune system. It contains anthocyanins, polyphenols, phytonutrients, plant sterols, omega fatty acids, amino acids, dietary fiber and various vitamins and mineral which help to lower cholesterol and improve blood circulation. Acai is the fruit of a palm tree that grows in the rainforests of the amazon- a tree brazilians call "the tree of life." because acai fruit is perishable, in the past, its popularity stayed only in brazil. However, improved processing of the fresh fruit is making it possible to preserve more of the fruit's beneficial attributes for use beyond the region. Since then, the news about acai has been steadily spreading, and the evidence of its nutritional and health benefits just keep on piling up. Acai earned its reputation as the most effective super fruit/ wonder fruit the world has ever known. 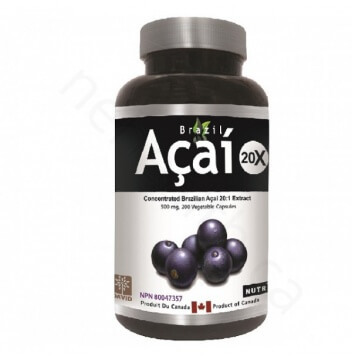 Brazil acai with its antioxidant (orac), is an excellent source of polyphenol, phytosterol, vitamin e, omega 6 and 9, anthocyanin and proanthocyanin.